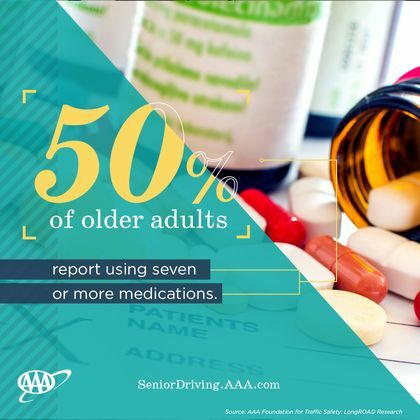 Nearly 50 percent of older adults report using seven or more medications while remaining active drivers, according to new research from the AAA Foundation for Traffic Safety. An evaluation of the medications people are taking found that nearly 20 percent of older drivers are using medications that the American Geriatrics Society says should be avoided because they have very limited therapeutic benefit, pose excess harm, or both. Drugs like these are called potentially inappropriate medications, or PIMs1. Most of these potentially inappropriate medications, such as benzodiazepines and first-generation antihistamines, are known to cause impairing effects such as blurred vision, confusion, fatigue or incoordination, and can increase a driver’s risk for a crash by up to 300 percent2.